I missed out on getting a copy of Rescube when Eric Fuller first sold them on Cubic Dissection in 2009, but managed to snag a copy when it came up on a recent auction at the same site. Rescube was designed by Sam Cornwell and entered in the 2006 IPP Puzzle Design Competition. The competition entry was made in pine and plywood and the subsequent version produced by Eric had a curly maple shuttle enclosed in a granadillo framework with (some) clear acrylic sides. The contrast between the light wood of the shuttle and the dark frame makes for a great looking puzzle and the clear sides dramatically enhance its looks. The shuttle rests snugly inside the frame that has a few sides half-enclosed in acrylic – three of them along the diagonal and two between mid-points of opposite sides. There’s one side exposed almost entirely, save for a single ‘tooth’ hanging from one side. The combination of half-open sides allows a little movement of the shuttle that can then be manoeuvred from its starting position to somewhere nearer the open side. The shape of the shuttle deliberately makes manoeuvring it inside the framework a bit tricky and restricts what it can do, rather successfully. Early on I decided what I needed to try and do based on the shape of the shuttle and the shape of the framework – spent a while getting the shuttle into the right spot to execute “the move” I had in mind, only to realise that it couldn’t work because of the tight tolerances between the pieces – it’s very unforgiving and will only let you solve it one way – excellent! Fiddling around a little more opened up some new possibilities, one of which turned out to be “the answer” – and it included a neat little twist on things that I hadn’t been expecting when I was trying to picture the likely solution. Until quite recently I hadn’t had the opportunity to spend much time exploring Perry McDaniel’s incredible handiwork. Sure, I’d spent a short time playing with Oli’s set of Sandfield Salt and Pepper cellars at MPP2, but I hadn’t made any progress on them so I only really saw the outsides … I’d seen some pictures from an IPP of a rather flamboyant looking guy in chef’s whites offering a plate of (wooden!) petit fours to (unsuspecting?) puzzlers and a few close-ups of said cakes and they looked yummy, so when I found a set of Perry’s Petit Fours available, I jumped at them – and if anything found that they look even better in real life. 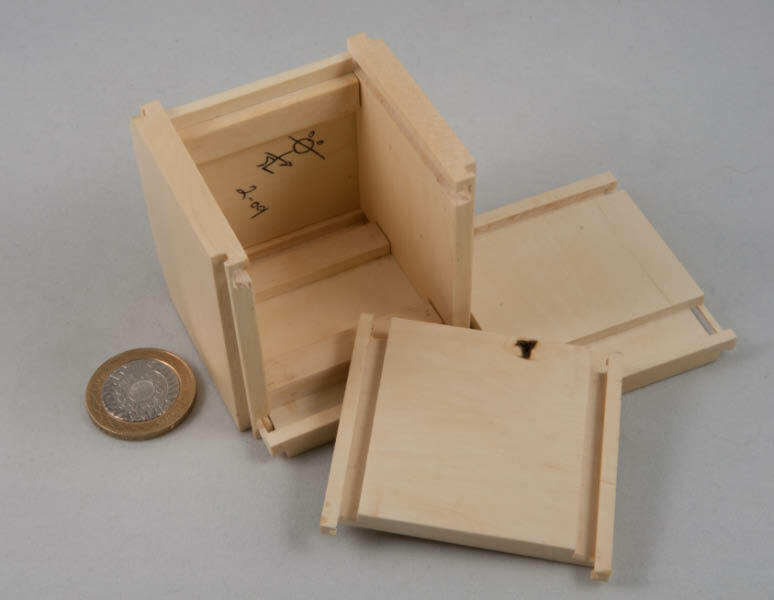 Each of the four boxes makes use of a totally different opening mechanism. 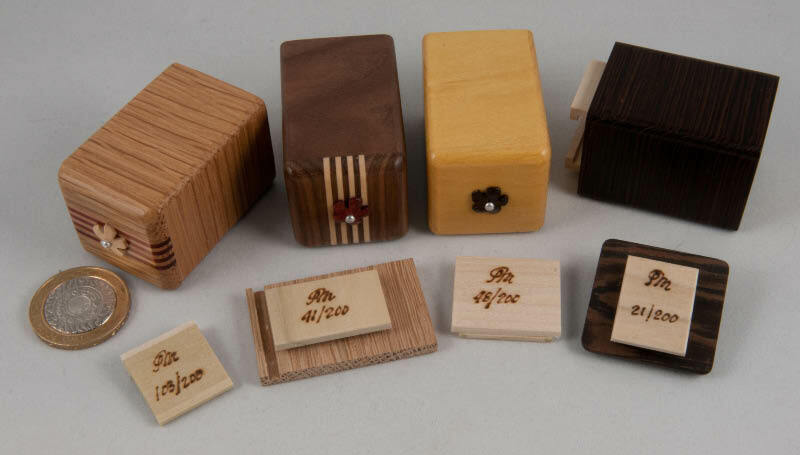 Overall – a beautiful little set of exquisitely manufactured interesting puzzle boxes – each individually branded and numbered by Perry – simply scrumptious! 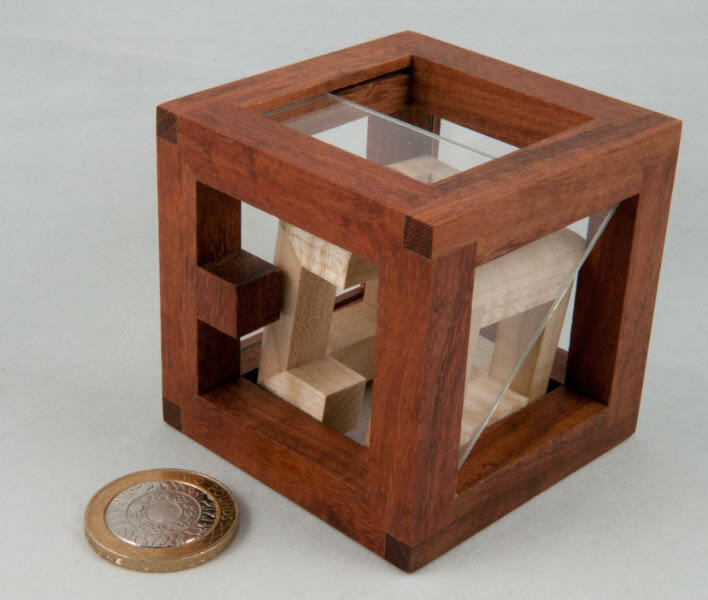 I recently managed to acquire a Stickman Snowball Puzzlebox. 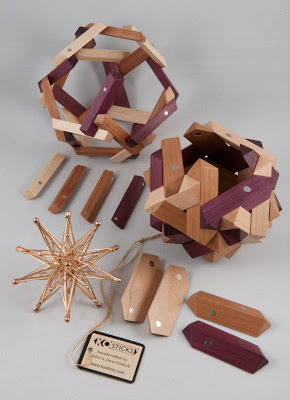 (Yeah, yeah – that same Cubic Dissection Auction I’ve been yabbering on about...) The Snowball is based on its smaller cousin, Snowflake, which was Robert Yarger’s 2006 IPP Design Competition entry. Whereas Snowflake was made in holly and just over 1.5” cubed, Snowballs are considerably larger(!) at 3” cubed and come in holly or walnut. Some Snowflakes were initially given away as gifts with ribbons attached so that they could be used as puzzling Christmas tree ornaments and a bunch were sold through Cubic Dissection back in 2005. From a distance, an unsolved Snowball looks like a fairly plain box with six unadorned slab sides – close up, the detail in the corners is pretty mind-blowing: when all the panels are closed properly, each corner appears to have three sets of interlocking orthogonal rails – and your brain will instantly tell you that if seeing is believing, and each corner looks like that (they do...) then opening this box is impossible ... great start! A bit of experimentation will get one of the panels moving – allowing closer inspection of those tricked-out corners ... very neatly done Master YodaYarger! Having slid one panel across releases the next panel, however, to my mind at least, the next move has a panel going “the wrong way” – my mind tells me that a panel with that shape and those cuts should not move in that direction, it should move in the other direction ... and so it continues! A bit of backwardsing and forwardsing and after seven moves, the ‘lid’ can be slid off ... and from there you can slide out each of the remaining panels as well, giving you a neat stack of six panels. At this stage it’s worth talking about those panels – a couple of them have sticks glued to them to limit certain movements, but on the whole, these are “simply” planks that have been cut in precisely the right place to create a set of interlocking rails and sliders and that astonishing corner detail. 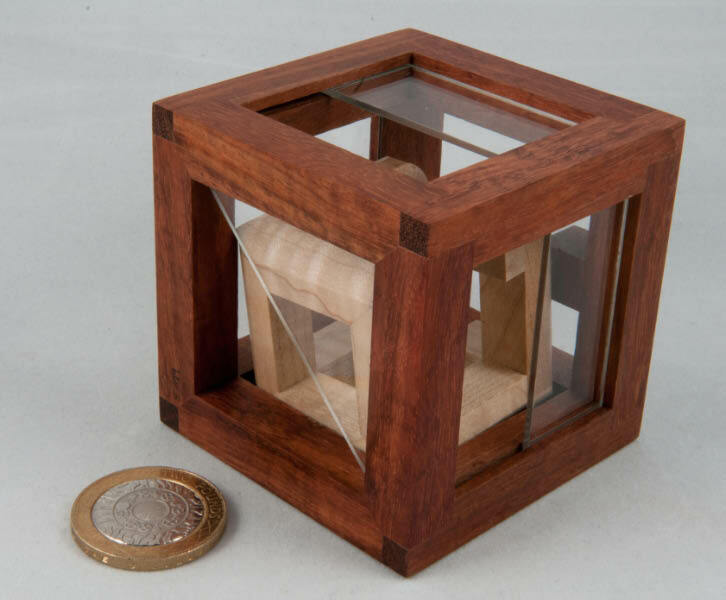 The efficiency of it is simply staggering – and I really get why Robert reckons that Snowflake was the closest he’s come to his idea of a perfect puzzle box: nothing is wasted in there ... very clever design Robert! 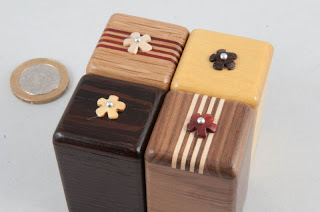 Brian Pletcher has written about his experiences with the Banded Dovetails over here. 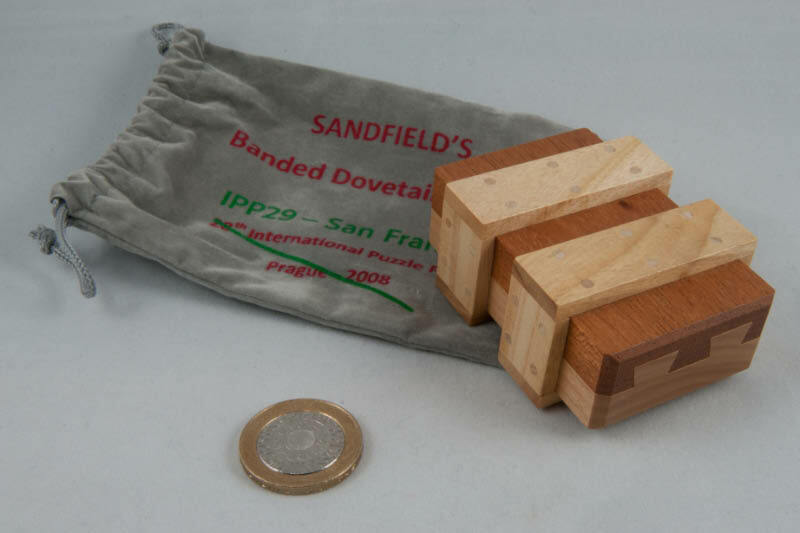 The Banded Dovetails continue the Sandfields’ association with tricked-out dovetail joints. Over the years they’ve given the puzzling world some rather impossible looking dovetail joints and used them to disguise some sneaky tricks. Rob Stegmann has a brilliant collection of Sandfield puzzles over here – take a look for yourself. 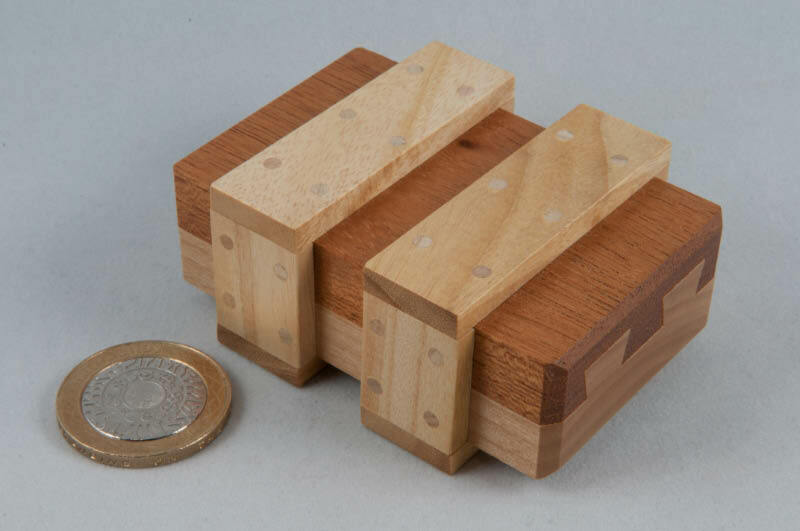 This particular puzzle has a pair of contrasting coloured boards joined by a set of beautifully made dovetails which appear to run the length of the boards. These boards are then surrounded by a pair of wooden bands that seem to be pinned to the boards themselves. 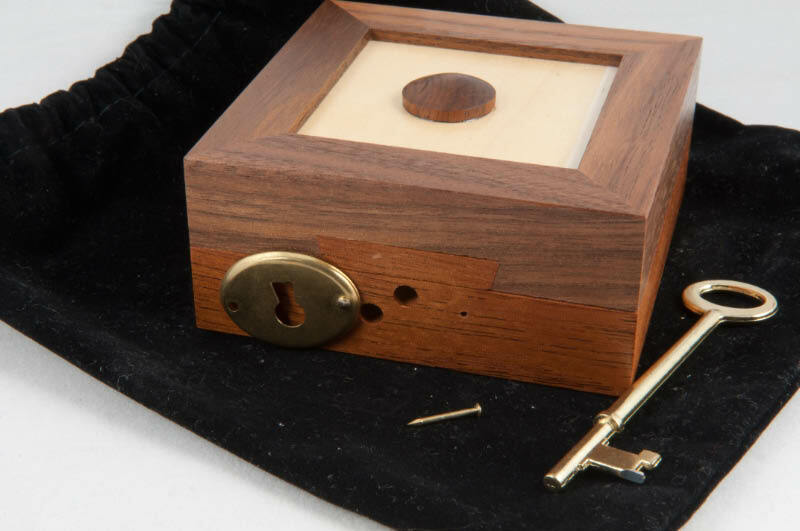 All this pinning and the joints themselves give the impression of a rather well-secured little object, which invites you to find, and open, the hidden compartment. Suffice it to say that “the usual” attempts don’t yield an awful lot, but when you do find the solution, it will put a grin on your face. 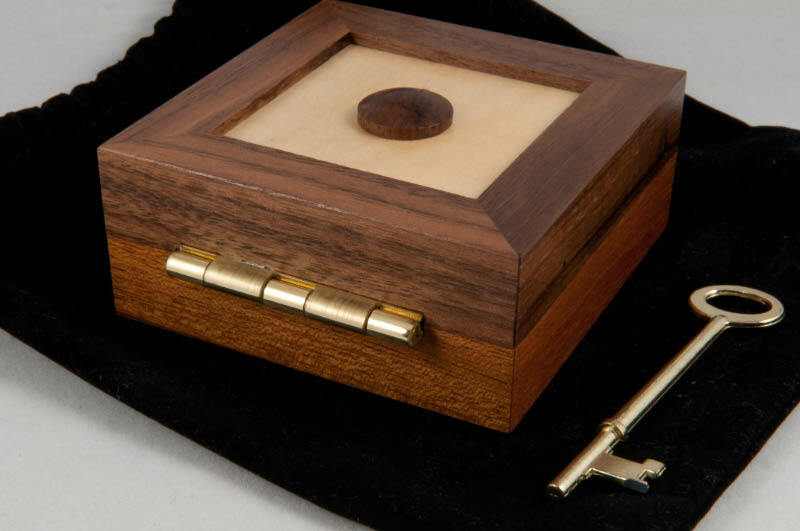 Kathleen Malcolmson has done a tremendous job of building this little illusion and then hiding its secrets from even the very closest of inspections – beautiful workmanship and incredible attention to detail. Along with their special flavour of cabinetry and furniture, the Kosticks have been quietly making awesome geometrical artwork for decades – John produces intricate interlocking bronze constructions – take a look at his stars over here … and Jane produces geometric masterpieces in wood. 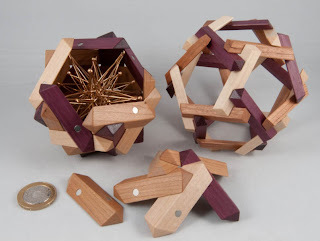 Their web shop sells their Tetraxis “magnetic geometry puzzles” direct and their website hints that the wooden sculptures may be available ... so I sent off an enquiring email asking whether it might be possible to get a wooden version of their Tetraxis puzzle (because I thought they looked absolutely gorgeous!) and received a reply from Jane pretty soon afterwards, full of enthusiasm, saying she’d be happy to make one up - what size, what shape, and what woods did I want? 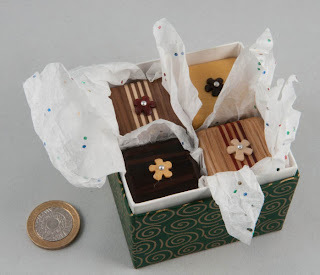 All of which sort of caught me off-guard, because I’m still not really used to crafts(wo)men like this making something up, especially for me – I was expecting to be offered something from a list of stock she had around at the moment ... I managed to get over all that and settled on a four inch set of sixteen axis sticks in a combination of maple, cherry and purpleheart. A few days later Jane offered me a matching sixteen axis silicon bronze star and it didn’t take long to say “What the heck, yes, please!”... I wandered off on my holidays and soon after I got back I had an email from Jane saying the sticks were all done and she’d be shipping them across the pond shortly. They duly arrived on Monday, along with the two plastic Tetraxis toys I’d ordered (‘cos they looked like they’d be fun to fiddle with!). Having a pair of the plastic Tetraxis toys means you can experiment with odd shapes and strange constructions or mix and match colours between the two standard shapes – I’m easily amused, I know... but the main attraction in the box was the fully assembled sixteen axis sculpture nestling in the corner – inside a couple of bubble-wrap bags. Suffice it to say that it looks a million dollars! The three different woods have all been clearly taken from the same boards - they all match perfectly – and the fit and finish is superb. 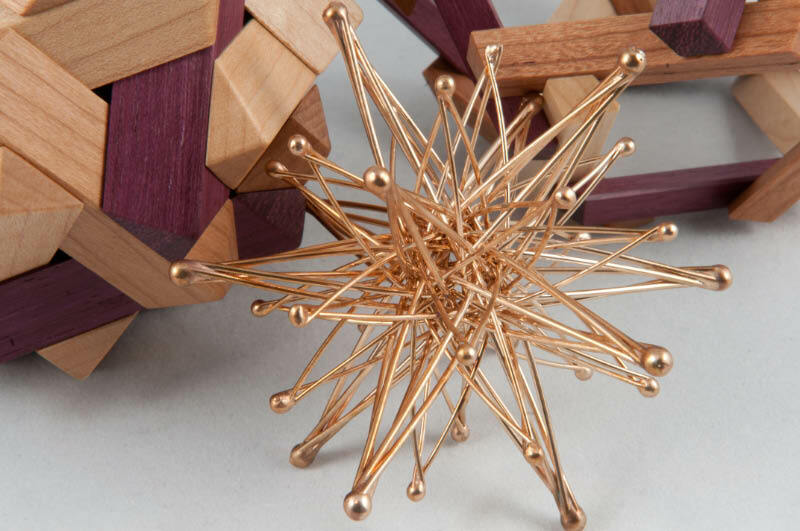 Each little stick has four individual neodymium magnets placed in exactly the right spot to automagically align the structures properly as you’re building them. - with a sixteen axis silicon bronze star deep inside all of that, with only the very tips of the major axes peeking through some of the holes in the six axis ball. The fit between those three layers is really good as you can see from the close-up, where the shiny ball in the centre is the very tip of the silicon bronze star peeking through from inside, while the outer shell touches all of the vertices of the inner pieces it passes across – and every piece is held securely in place, with a really positive click, by those perfectly placed magnets. 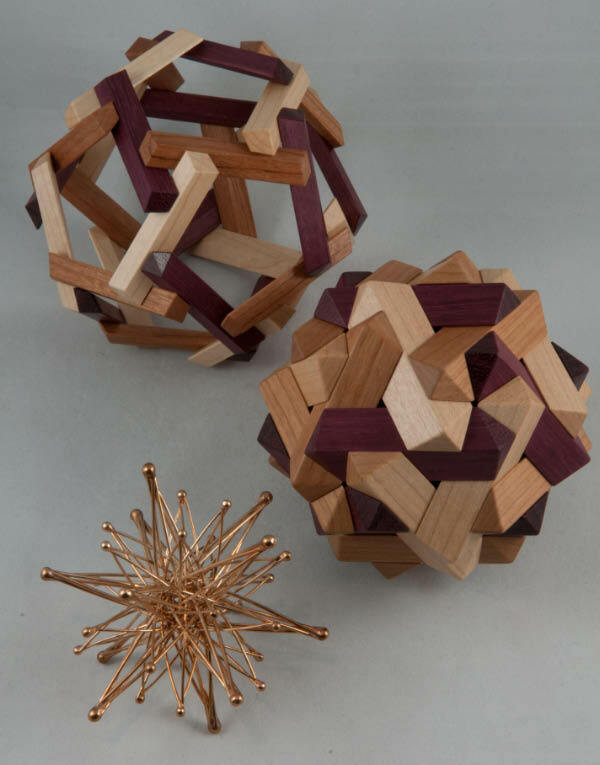 Not only a beautiful piece of art to admire, but a therapeutic toy to fiddle with and experiment on. 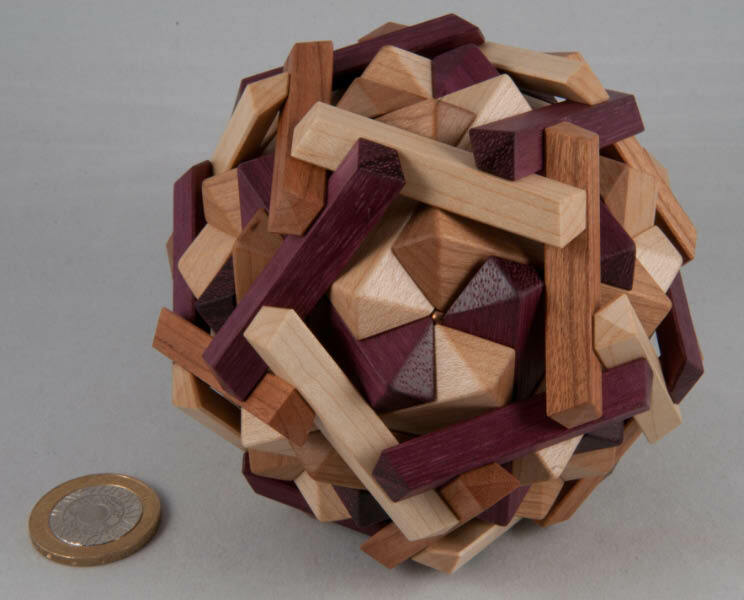 What might have started out life as a means of teaching geometrical concepts has turned into a lovely puzzling piece of art. Thanks Jane and John – I love my sculpture – all the best for your future puzzling endeavours! The Jewel Box was Robert Sandfield’s 2003 IPP exchange puzzle in Chicago. 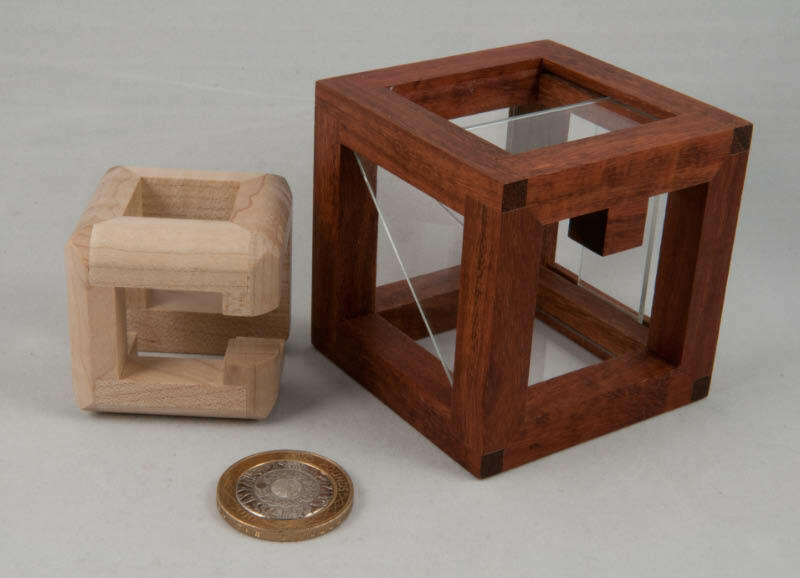 He designed the puzzle and it was manufactured by Perry McDaniel who produced some 200 Jewel Boxes that were supplied in a black drawstring bag. 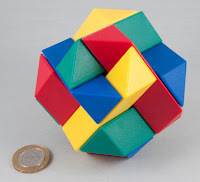 OK, so you’re a puzzler – how do you set about trying to solve a new challenge? and it’s nothing like I thought it was going to be! 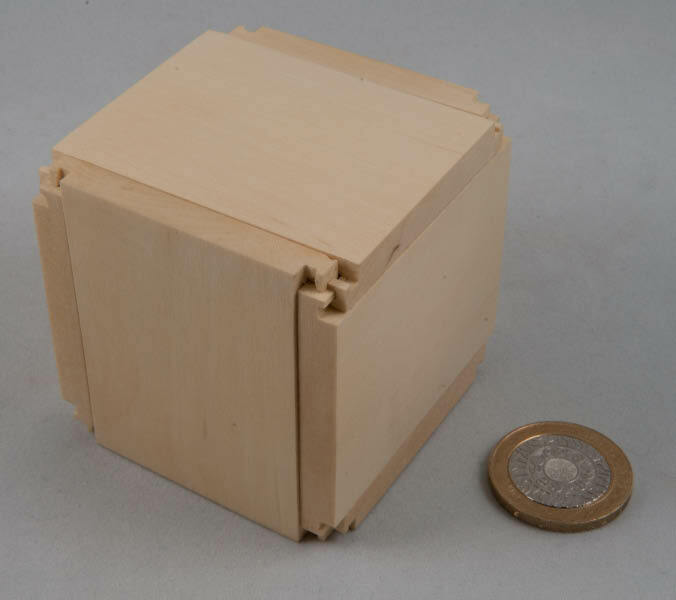 It is a delight to open this puzzle and see for the first time what was useful and what wasn’t … most of it wasn’t! This puzzle was created to delight and amuse puzzlers – and it succeeds brilliantly. 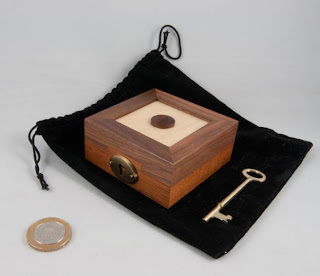 The number of in-jokes sprinkled liberally around such a small box is staggering – and I realised after I’d solved it when I was reading Robert’s walk-through that I’d missed a couple of them along the way. I reckon every serious puzzler needs to have a crack at this one for the sheer fun it provides. MPP3 - That was fun!